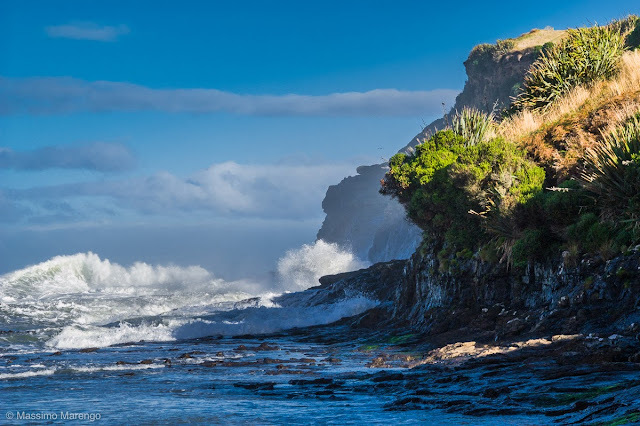 The unpaved road ended at Curio Bay, home of a petrified jurassic forest, a Hector's Dolphin pod, and a yellow eyed penguin colony. We didn’t see any of the above. The sea was so rough that I am quite sure the dolphins were resting in some quieter waters and the penguins were getting their fix of fishes far from the crashing waves. What about the forest? Well, the forest is in the photo above... just submerged. It is best visible at low tide, and we clearly didn’t time it right. The view of the bay was however quite spectacular and worth the stop, with some of the most amazing surf I have ever seen (and heard, the thunder of the waves breaking on the rocks is quite deafening). The spray can get very high, as you can see in the photo below, taken from the top of the cliffs. Below the cliffs there is a beach, were occasionally sea lions can be found (nope, we didn’t see them either). The place was in fact completely empty, I imagine because of the low season and the foul sea. 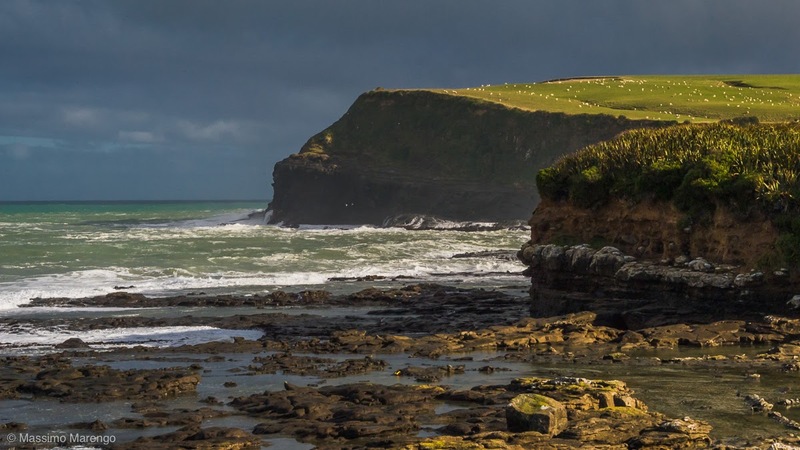 The shores of the Catlins are famous for their numerous ship wrecks: with these waves it is not difficult to understand why. In the middle of the Catlins there are diminutive falls that somebody with sense of humor called “Niagara Falls”. We didn’t see the falls, nor the town with the same name, but we did stop in the neighborhood. It was already past lunch time and the town of Niagara was the first settlement we had passed in several hours. We stopped at a nice wooden construction along the Niagara-Waikawa road, with a large “Niagara Falls Cafe and Art Gallery” sign in the front. The entrance is through the art gallery, which we didn’t have much time to explore. The cafe proper is in a luminous room facing a large patio which was closed, due to the cold weather. In the large garden, a goat with a stick stuck on her horns (to prevent her to stick her head in the fence, which apparently she had enjoyed one too many times). On the wall there was a newspaper cutout with the story of the cafe. The owner was a nice New Zealand-born lady that until a few years before was a high level manager of some company in Australia. She got sick of the rat-race, came back home, found an old run-down school building in the middle of the Catlins and converted it into a cafe. The location may seem a little isolated (it was the only place we found in hours of driving), but that same isolation, along a road that is traveled by massive amount of tourists in summer, must be a boon for the business. Deserved business that is, as the sandwiches we got were quite good, the cafe was excellent, and the cake topped with ice cream was even better. Restored, we left the cafe directed to our last Catlins stop: Nugget point and its penguin colony. But that is a story for the next post.